It is very common for a receipt to be tucked inside a book upon purchase. People commonly use them as bookmarks, too. But it's certainly less common to find a book's receipt tucked inside its page 68 years after the fact. That's the case with this yellow receipt for "Principles of Abnormal Psychology: The Dynamics of Psychic Illness," which was written by Abraham H. Maslow and Bela Mittelmann and originally published in 1941 by Harper & Brothers. 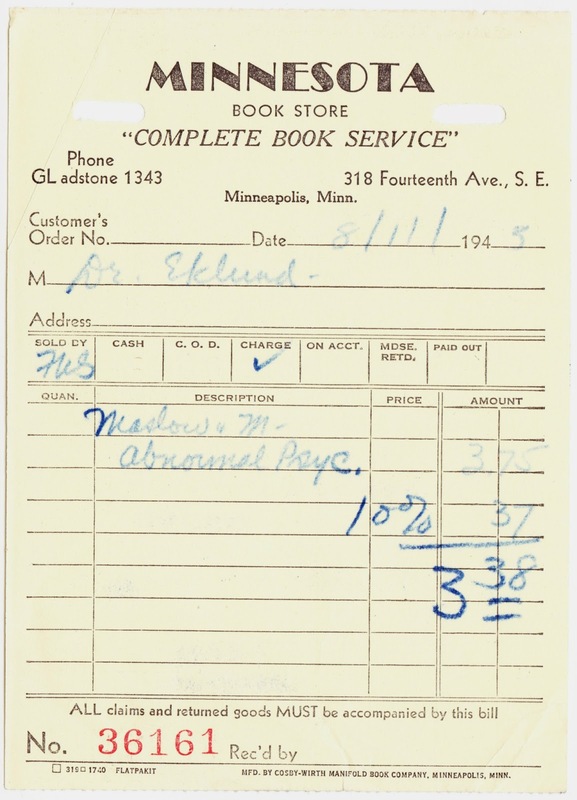 The receipt — dated August 11, 1945 — indicates that a Dr. Eklund charged the textbook when he made his purchase at the Minnesota Book Store, located at 318 Fourteenth Ave., S.E., in Minneapolis, Minnesota. Perhaps the doctor had an account there? The book's price was $3.75, which translates to about $47 in modern dollars. And Dr. Eklund didn't even have to pay $3.75. He got a 10% discount, bringing his total to a tidy $3.38. Finally, the small type across the bottom tell us that this is a Flatpakit brand receipt, manufactured by Cosby-Wirth Manifold Book Company, also of Minneapolis.